What Day Should I Have It? Outer Banks condos from First Flight Rentals offer numerous options for beautiful beach weddings and wedding ceremonies. Allow your guests to stay in premier condos and have the ceremony onsite, either oceanfront or soundfront. We can help suggest local wedding planners, officiants, and party venues that are within close proximity to the condo communities in Kill Devil Hills and Rodanthe. There are numerous alternatives on the Outer Banks for wedding parties and ceremony venues. 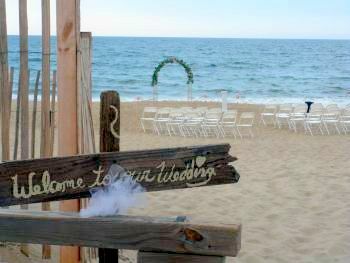 First Flight Rentals offers several Outer Banks wedding venues that have different features for your special day. First Flight Retreat offers an outdoor, oceanfront ceremony venue, with numerous restaurants & bars nearby for the reception. Waves Village Resort offers a soundfront ceremony venue with the option to have the party at the onsite restaurant, Good Winds, and with Rodanthe Sunset Resort nearby, the ability to rent up to 15 3BR condos for the wedding group. Sea Ranch Resort Condos offer an onsite ballroom facility and restaurant through the adjacent Sea Ranch Resort Hotel. All venues offer the ability for flexible wedding party sizes (10-75) to stay at the ceremony location, and enjoy all the benefits and amenities of premier Outer Banks condo rentals. When to have an Outer Banks Wedding? 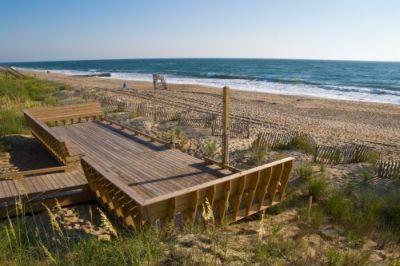 The best Outer Banks weather is from May - October, keeping in mind peak beach season is late June through early August when the beach is full and rates are typically higher for condo rentals. Offseason months may offer better rental rates, although weather can be more variable. Keep in mind, other guests and beachgoers may be staying at the condos as well, but it is typically not an issue. Unlike house rentals, many of First Flight Rentals condos offer flexible weekly stays and depending on the condos and time of year, the option of partial week stays (3 or 4 night stays). We recommend having a wedding celebration in the middle of your stay so to not have to check out at 10AM on the morning after the wedding. A mid-week check in should be considered. Groups planning a wedding ceremony at First Flight Retreat, or Waves Village Resort, should understand the risk of it raining on your wedding day. We suggest have a back up plan, or consider a tent rental. We do recommend you and your guests purchase travel insurance. Hurricanes are a reality, and hurricane season runs from July to November. Be sure to ask our reservationists for any details about the policy, or contact insurance company directly. Come Down for a Walk Through. We strongly suggest that you come visit during your wedding planning. We are happy to meet with you, tour the condos and the wedding venues. 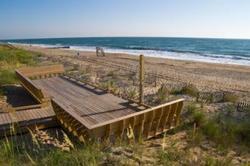 That also provides an opportunity to meet local Outer Banks wedding vendors, planners, etc. that will play key roles in planning that special day! The Outer Banks beaches are all public. The property line for beachfront property is the "mean high water", which means that wedding ceremonies can be held on the dry sand area and still be on private property (for First Fligh Retreat weddings). This does not mean the public can't walk by or observe (though Outer Banks beaches are NOT known for the crowds!). This should not be an issue, but just something to be aware of. We also suggest checking tide tables when picking a time of day for the beach wedding venue. 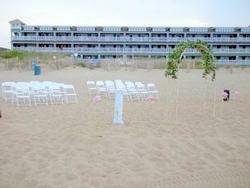 Parking can be a major issue for Outer Banks weddings. Wedding ceremonies will require parking for guests that are not staying at the condos. Fortunately, our condo communities typically have plenty of excess parking so this should not be an issue. We suggest checking with us or the condo associations to confirm parking availability. 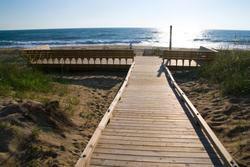 All Outer Banks condo communities have elevator access to each level, including parking levels. First Flight Retreat has a ramp to the oceanfront dune deck. Waves Village Resort has a soundfront pier that is easily accessed. There are event fees for wedding ceremonies at the different condo communities. We also offer packages for small weddings that include a condo rental (coming soon). Please call 866.595.1893 for pricing on larger wedding parties. Security deposit is typically required for any Outer Banks wedding event. To get married in the State of North Carolina, you must have a marriage license. Open Monday through Friday, 8:30am - 4:30pm. Call 252.489.4747 for condo wedding rates, or email us your Outer Banks wedding plans and we can discuss options available.